Authorities in northwest China are implementing a set of “stability maintenance” measures in Xinjiang during Ramadan, but sources say restaurants have been ordered to stay open throughout the Islamic holy month as part of the directive, suggesting efforts to undermine the Muslim tradition of fasting. According to a recently issued notice entitled “2017 Work Conclusion on the Stability Maintenance of Xinjiang during the Ramadan Period,” the Industrial and Commercial Bureau of Aksu (in Chinese, Akesu) prefecture’s Bay (Baicheng) county has adopted several measures to “ensure social peace and harmony” during the holy month observed from May 26 to June 24 this year. The bureau, which regulates business and alcohol licenses for restaurants, will “strengthen leadership,” “control,” and “inspection” in the county, and “widen the scope of propaganda [to] focus on prevention,” said the notice, issued following a series of meetings held by the Xinjiang Uyghur Autonomous Region Communist Party Committee. Temporary evening “security checkpoints” will be set up to “ensure that all vehicles, individuals, and suspicious things are inspected and recorded,” the notice said. Separately, students in Hotan (Hetian) prefecture’s Qaraqash (Moyu) county will be gathered on Fridays to “collectively study, watch red [communist propaganda] films, and conduct sports activities” in a way to “enrich their social life during the summer vacation,” the notice said. Fridays are customarily prayer days at mosques, while those who go without food between dawn and dusk during Ramadan rarely have the energy to take part in sports events, suggesting authorities may be trying to prevent the largely Muslim ethnic Uyghur inhabitants of Aksu and Hotan from observing the holy month according to Islamic tradition. 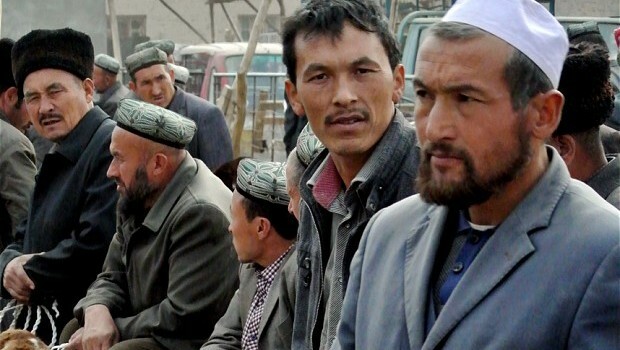 A Han Chinese official with the Political Law Committee of Hotan prefecture refused to answer a request by RFA’s Uyghur Service to clarify whether the measures were meant to stop Uyghurs from fasting and praying during Ramadan. “If anybody fails to comply with this order, they will be dealt with, and while I’m not sure of the specific punishment, [the restaurants] should be open no matter what,” said the official, who also asked not to be named. According to the Zawa official, teachers, public servants and employees in the service sector are “not allowed to fast” during Ramadan. “It is strictly prohibited and if they are found fasting during this period, they will be dealt with,” he said. Uyghurs working at restaurants around the region confirmed to RFA that their businesses had been ordered to remain open during Ramadan, a directive that has also been issued in previous years in Xinjiang. “Yes, we were ordered to keep our restaurants open,” said a Uyghur staff member at a restaurant in Kashgar (Kashi) prefecture’s Kashgar city. The order to keep restaurants open during Ramadan does not appear to have been extended to other Muslim minorities living in China. An ethnic Hui Muslim restaurant owner in Ningxia Autonomous Region’s capital Yinchuan said he would be closing his business for Ramadan, much like he does every year. “I have run this restaurant for 30 years and I have never received an order to keep it open during Ramadan,” he said. Officials in Hotan city also ordered restaurants and stores selling food and drink to remain open during fasting hours, with fines imposed on owners who failed to comply.